Yesterday my friend Sue and I grabbed a few hours crafting together. This was the result of my endeavours using her stamps and the techniques we learned from the wonderful Barbara Gray of Clarity Stamps dvds. I'm still having trouble with my brayering but its getting there! With Clarity Stamps, being clear, placing them properly is a doddle - I now wish ALL the stamps in my collection were clear. 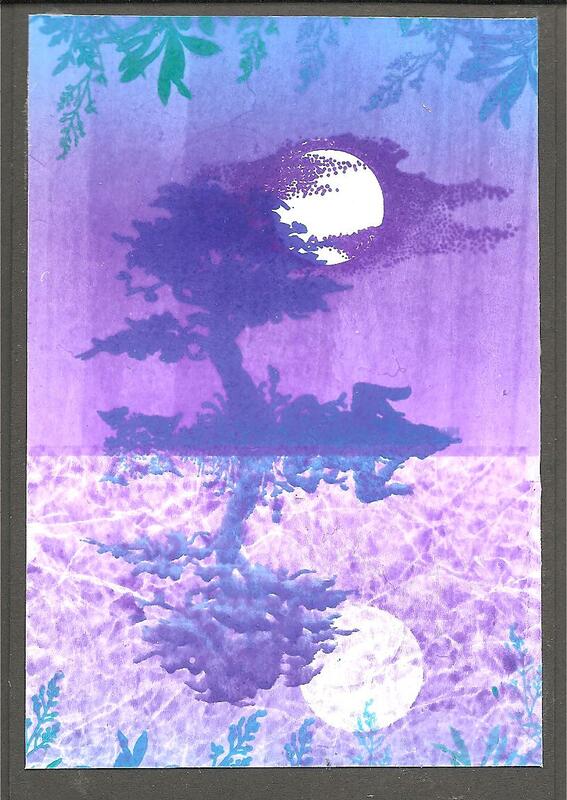 The moon stamp wasn't clear and so that was a lot more hit and miss - Sue was really much better at placing hers correctly than me but I managed this one ok.
That is so lovely... great colours, special effects and so emotive. Must get my brayers out again..
Waauw, this is very beautiful Penny!! Wow! Your picture is so beautiful. I love the reflection and I am thinking that it must have taken a long time to get exactly right. Gorgeous end result, Penny! Love the colours and the reflection is awesome! This is so beautiful, I just love the colours you've used. Wonderful, I just love the colors! Thanks for commenting on my blog! Tried to leave a comment yesterday and blogger was playing silly b*****s so I'll just say, you've done Barbara Gray proud! this is really awesome!! i didn´t have my brayers out in ages, i´m afraid i am not good with them... your colors are great and the position of the "mirror" is exactly right! You got a lovely effect with this. I love the colours and I must say that you have a great sense of layout and design that shows in everything you do. Absolutely wonderful, Penny! I've seen Barbara G demo a few times and she always produces the goods. Your reflection is really good. love the colours on this..enjoy your sons party. we are having a party too for my 7yr old but he wont let me cut his hair so its long!